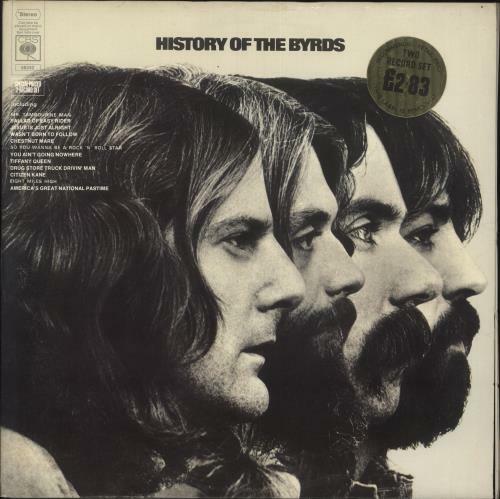 THE BYRDS History Of The Byrds (1973 UK plain orange label 28-track double LP compilation, gatefold picture sleeve with fantastic Pete Frame 'family tree' throughout the inner spread. The Byrds gave the public and the recording industry theirfirst taste of electric folk music, Indian music, electronic experimentation, space music, country rock, Jesus rock...and some of the most magical and personal music the world has ever heard. The sleeve has a very small sticker mark in the topright corner, some minor storage wear and a area of discolouration to the reverse, however the vinyl has very little sign of play).